Notre-Dame de Paris' artistic and musical significance, poet Roger McGough on his new collection, and a review of TV drama Chimerica. As France vows to restore Notre-Dame de Paris after last night's devastating fire, we discuss the artistic, musical and cultural significance of this great Cathedral. With music historian Mark Everist, art critic Waldemar Januszczak and French literature academic Eve Morisi. Roger McGough, one of Britain’s most widely read poets, talks about his latest anthology, joinedupwriting, in which he explores themes of childhood, ageing and politics. He reflects on the appeal of different forms of verse and how the critical reaction to his work sits with its popular appeal. Lucy Kirkwood's hit 2013 play Chimerica comes to Channel 4 as a new TV drama series, updated to the Trump era. Sarah Crompton reviews. 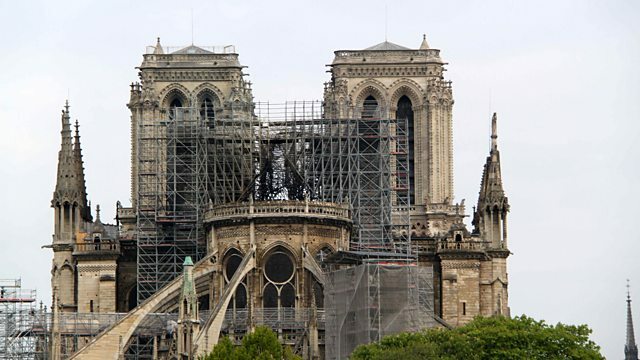 Main image above: the fire-damaged Notre Dame Cathedral, Paris. Roger McGough's latest collection of poetry, joinedupwriting, is out now. Roger McGough's UK tour continues... he is in Nottingham on 27 April 2019, Wirral on 10 May 2019, and then goes on to visit Sheffield, Deal, Hay, Peterborough, Grantham, Ledbury, York, Rydale, Grassington, Wirksworth, Winchester, Bridport, Teddington and Liverpool before the tour ends in Chester on 18th and 19th December 2019. Channel 4's series Chimerica is on Tuesdays at 9.00pm from 17 April 2019, and the full series is available to download from All4.